Oil closed higher for the second straight day as Russia and Saudi Arabia signaled they’re on track with production cuts designed to avoid a global supply glut. Futures in New York staged a mid-afternoon recovery on Wednesday to top $52 a barrel, shrugging off bearish U.S. demand data. 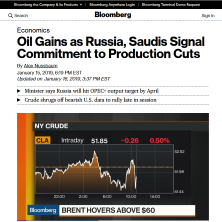 Russia will meet its target for curbing output in April as part of its agreement with OPEC, the country’s deputy energy minister told reporters. That followed a U.S. report showing Saudi Arabia slashed shipments to American refiners by a third last week. West Texas Intermediate for February delivery rose 20 cents to settle at $52.31 on the New York Mercantile Exchange. It had slipped as much as 1.6 percent earlier in the session after the U.S. Energy Information Administration reported a big jump in fuel stockpiles. Brent for March settlement advanced 1.1 percent to $61.32 on the London-based ICE Futures Europe exchange. The global benchmark traded at an $8.71 premium to WTI for the same month. Crude has surged back into bull-market territory after shedding almost 40 percent during the final three months of 2018. The momentum has been spurred by improving trade relations between the U.S. and China, as well as the start of output curbs by Saudi Arabia and other major producers. Still, prices remain more than 30 percent below their early October level. The EIA said stockpiles of gasoline climbed by 7.5 million barrels last week — twice the jump analysts had forecast — while American oil drillers pumped a record 11.9 million barrels a day. At the same time, Saudi sales to U.S. refiners fell by 32 percent in the week ended Jan. 11.